None I could understand but it was based on a picture and some events that happens at the end of the war in Warshow. You could easily make a correlation with some resistance intervention that main objective should be to kill all german officers that are in the City of Warsow. Even if the first idea was quite interesting in making a translation of a short moment of the polish history and the end and regarding that this relaese is the third from Robert, it left more disappointment than enjoyment. Design, as a first global look, especially through the documentation added seems quite promising, and so is goes on as you first progress, Architecture has a good consistancy but will quite fast tumble through it's obvious repetition by simply copy/pasting of building with some tight stairs and repetitive textures and doors that need to be open for exploration. In addition to this you will also encounter one of the think I dislike the most in modern mapping: invisible walls that block you way but not your eye looking. Scale is perfect and for sure the creation according the original is well done but those highlights looks pretty weak in regards with the whole unit. 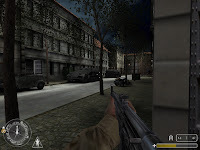 For the gameplay it's quite straight forward and certainly too challenging with enemies respawn in those small strairs and hallways, you will certainly have some surprise when, on a corner, a german soldier will rush on you. 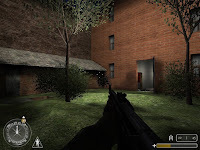 Those doors that need to be open can cause also some frustration while not opening or in the wrong way...don't rush but sneak and kill all enemies as fast as you can to prevent frustration...In term of objectives everything seems quite obvious and if you look constently to you objective orientation you won't have any problem especially with the last one... that don't need you to get back to the starting place. In conclusion : The idea was quite original and the first impression was also going in the same direction, but finally through a boring and repetitive gameplay the player, or at least me just finish this one without any good feeling or enjoyment.